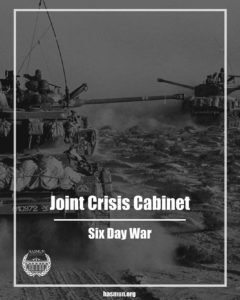 The Joint Crisis Committee, is a committee which we discover new paths in history with our decisions. While every delegate representing a character in history, they also combine their ideas with the ideology of who they represent. Every action you take has a consequence, either good or bad. Even though Joint Crisis Committee is based on war, delegates will also face with many other problems regarding the economy, politics etc. as well. Don’t forget, you are not just a commander, you are a person who is dealing with the whole country. As we move to the agenda item of our committee, Six Days War has some differences if we compare with the agendas of usual JCC’s. Reason behind that is in this war, Israel is fighting against many Arab countries just by itself. After the Arab-Israeli War of 1948, relationship between Arabic countries and Israel was not stable. Israel invaded the Sinai Peninsula in 1956 which caused the Suez Crisis. In the following years, there were some minor border clashes between Israel and Arab neighbors. When the calendar hit the 1966, Syria and Egypt signed a mutual defense agreement, and another agreement with Jordan followed it in May 1967. Delegates of both sides are expected to overthrow each other and do what is right for their country.